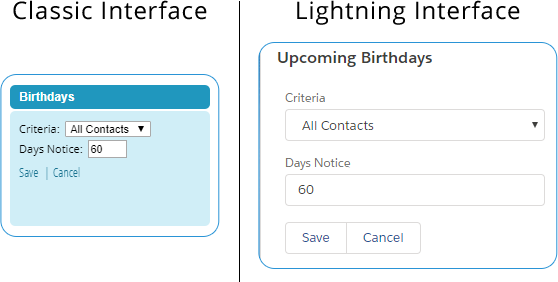 Birthday Reminders Contact birthdays in the Salesforce UI. Too soon? Looking for installation instructions instead of the user guide? The compact design of this application allows for unobtrusive notifications directly within the Salesforce user interface. It is easy to navigate, intuitive, lightweight and provides single-click access to the Contact itself. Best of all this application is 100% native so it can be installed in any Edition of Salesforce. Lightning or Classic. Due to differences between the Classic and Lightning editions of Salesforce, we've had to provide multiple ways to interact with the application. There are two Lightning layout options. One that displays the list of Contacts vertically and another that displays Contact horizontally. There is one Classic layout and it is a vertical list that can only be accessed from the Classic sidebar. The vertical Lightning widget displays the Contact name & day/month of the birthday. If you mouseover the content the widget will replace the month/day with the full month, day & year of the birthdate plus the age and number of days until the birthday. The horizontal Lightning widget displays the Contact name, day/month of the birthday, age the person will be turning and the number of days until their birth date. If you mouseover the content the widget will replace the month/day with the full month, day & year of the birthdate. The Classic widget displays the Contact name & day/month of the birthday. If you mouseover the content the widget will display more details including the age the person will be turning and the number of days until their birth date. There are two levels of settings for the application. There are organizational level settings that define the application accessibility and widget to be seen by Users in Salesforce. There are also individual settings that permit each User to customize the app further. Individuals may customize the application based upon personal preferences. Personalization is accssible from within each widget by clicking the gear icon (Lightning) or the "Settings" link (Classic). The application can be customized at an Organizational level that allows administrators to customize the numbre of record being displayed or how many days out the logic will look for birthdays. Some default settings are pre-built into the logic so this level of customization is not necessarily in need of revision. Organizational level settings should be maintained by System Admins only. Navigate to the custom settings object within Salesforce setup. Enter "custom settings" in the Quick Find form or navigate Setup > Custom Code > Custom Settings. Look for the custom setting with the Namespace Prefix of ities_bsc. Click the "Manage" link located on the left-hand side of the row. On the following page there will be a section for the "Default Organization Level Value" and a section for other hierarchy specific settings. Click the "New" or "Edit" button near the "Default Organization Level Value" section. Edit any of the settings you wish. Fields left blank will default to the settings defined in the table above. Note: Changing the "Records (Horizontal)" and "Records (Vertical)" settings will impact the look & feel of the application. You will have to adjust your page layouts to accommodate as appropriate. The application utilizes the language code setting for individual Users to determine the translations that will be displayed in the interface. The default language is English.